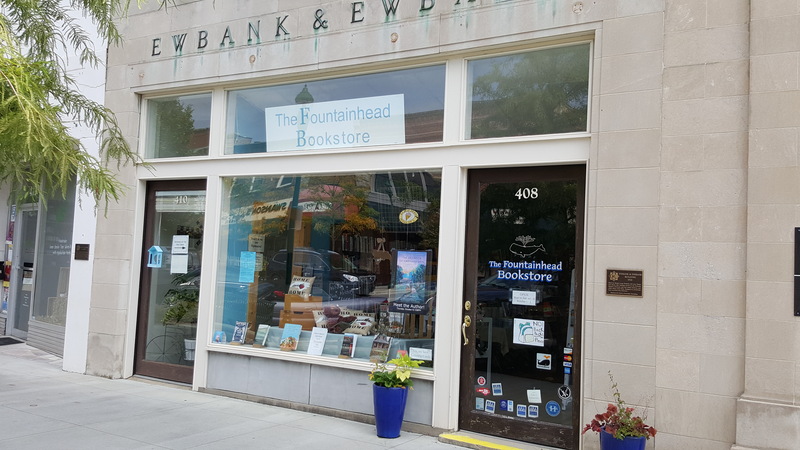 I visited The Fountainhead Bookstore in Hendersonville, NC recently – a cool bookstore in a great town – for the bookstore’s Bookapalooza event. I got distracted by books and fun stuff inside the store and forgot to take pictures, but I got nice shot out front the next day. 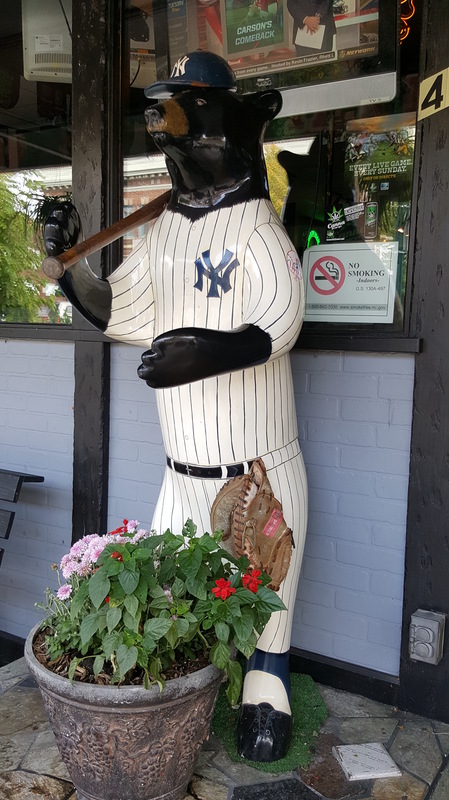 And there was the baseball bear in front of the bar/grill. I didn’t eat there this time, but there is always next time. I used instagram to combine some photos of the main street. Like many thing, I’m still figuring instagram out. But look at the shops and the bears! My mom and I are in a few of these too. Mainly posing beside artsy bears. All and all, I great visit to a great town! I graduated from UNC-Chapel Hill in May, 2000! I’m excited to get to come back and chat about writing and my books. Come by the SILS Library in Manning Hall today at 5pm to join us. 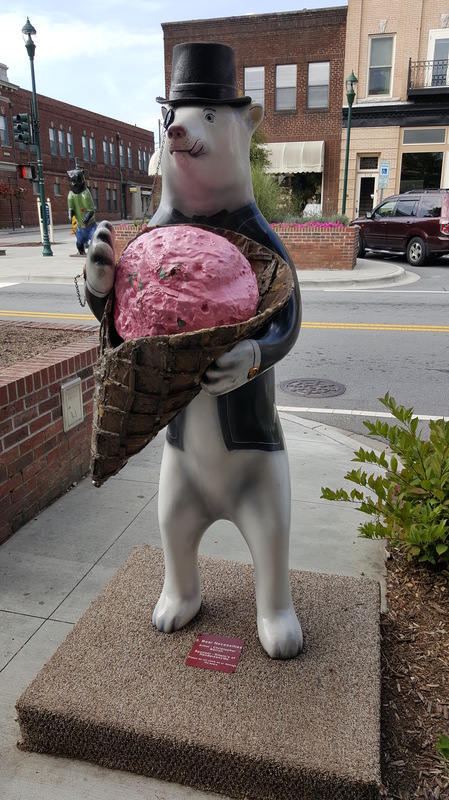 After a great time instructing the Write-On Camp at the Weymouth Center in Southern Pines earlier in the week, I’ll be doing a condensed version for kids in Asheville at Spellbound Children’s Bookshop this Sunday, August 9th, at 2pm. Come and join us for storytelling and story writing. To celebrate, I wrote the following. NOTE: Don’t worry. That’s the only almost poem I’ll write today. Asheville is a great town with great indie bookshops. 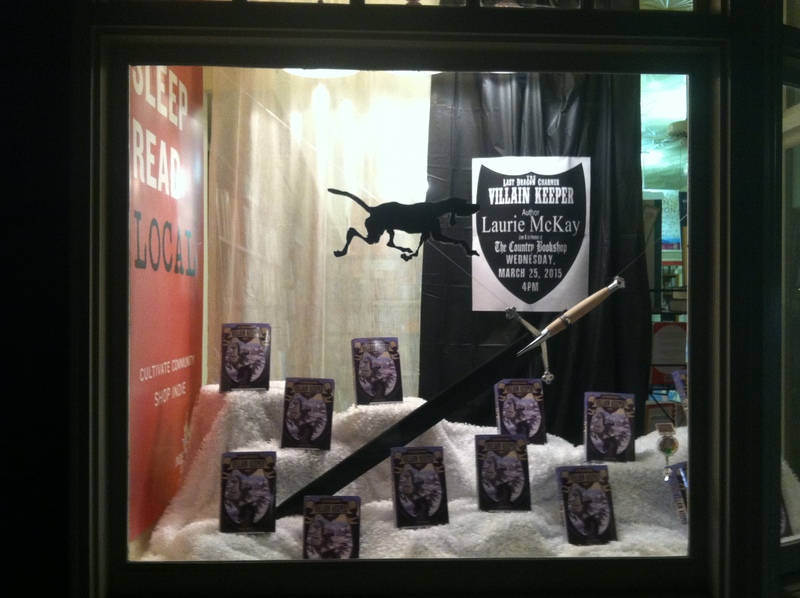 I’m so excited to visit Malaprops on June 14th at 3pm. It’s on the schedule here and everything. I have some fun and games I plan to bring. 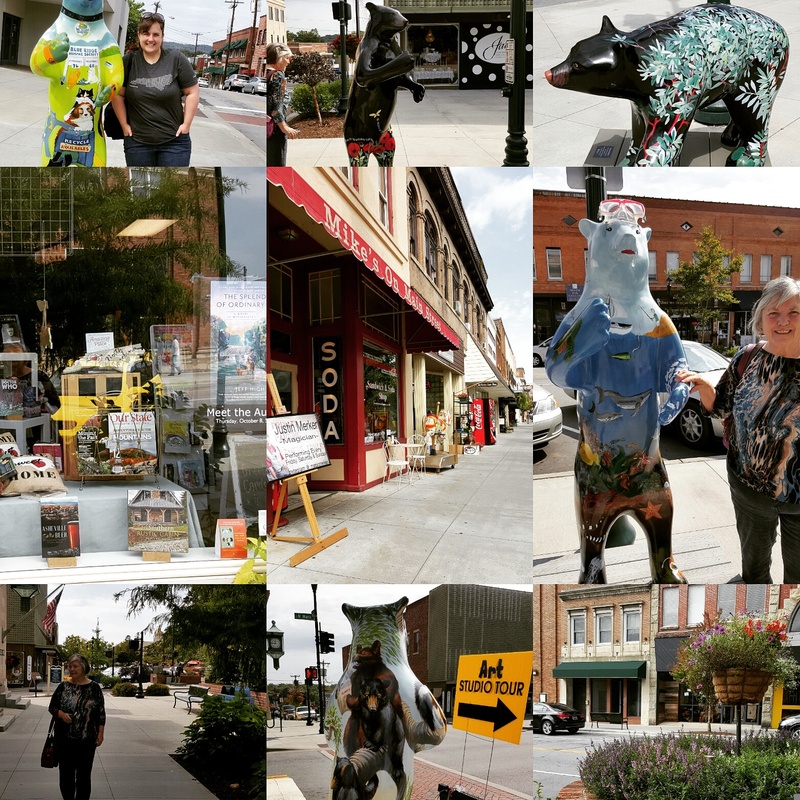 Asheville inspired my series. One of my characters is a metal artist. 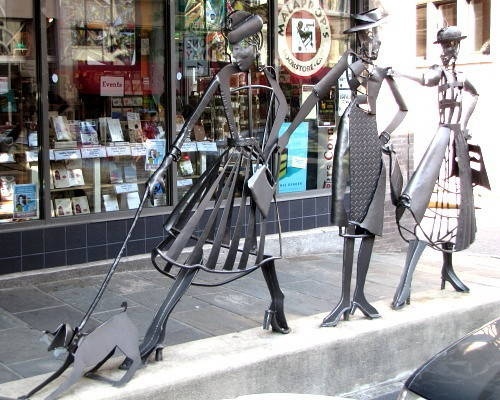 Whenever I write about her, I think of this sculpture in front of Malaprops! And there will be books, too! I had a wonderful time chatting about books and writing with the 3rd, 4th, and 5th graders at FPG Bilingüe Elementary in Chapel Hill! Children’s Book Week – Scuppernong Books. On May 7th at 6pm I’m going to visit Scuppanong Books in Greensboro, NC for Children’s Book Week. There will be other events this week and tomorrow night – including a picture book author and a poetry group. Also Scuppanong has wine, coffee, and sweets so it’s a great place to come for books and revelry! If anyone doesn’t know, Scuppernongs are tasty sweet grapes that grow in NC and South. Wild vines of them used to grow out in the backyard of the house where I grew up. Two Great School Visits in one day! Yesterday, I had a wonderful time visiting students. I stopped by Southern Middle School first. Their mascot is a DRAGON! As I like dragons, and have them in my book, I took this as a good sign. In the author presentation I put together, I talk some about writing (and, of course, my book) and also how much the editing/revision process improved it. There’s a part where I read a short sentence or passage and then have the kids guess what type of editorial comment was attached to it. I was lucky enough to visit Sandhills Classical Christian that afternoon. 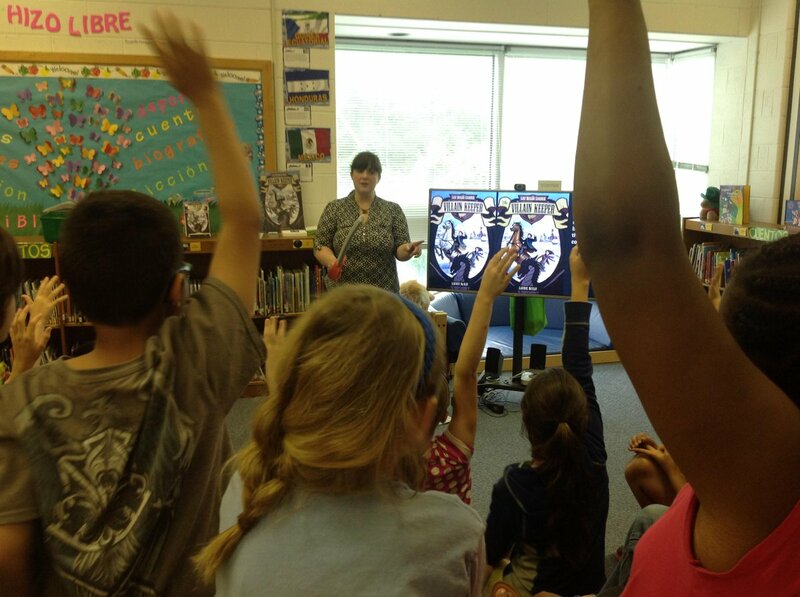 The students and I chatted books and talked about writing. They also knew how to fix the projector when my presentation turned green. To top it off, I saw a friend of mine, Ashley, who I hadn’t seen since I graduated high school. What a wonderful surprise and a great day! 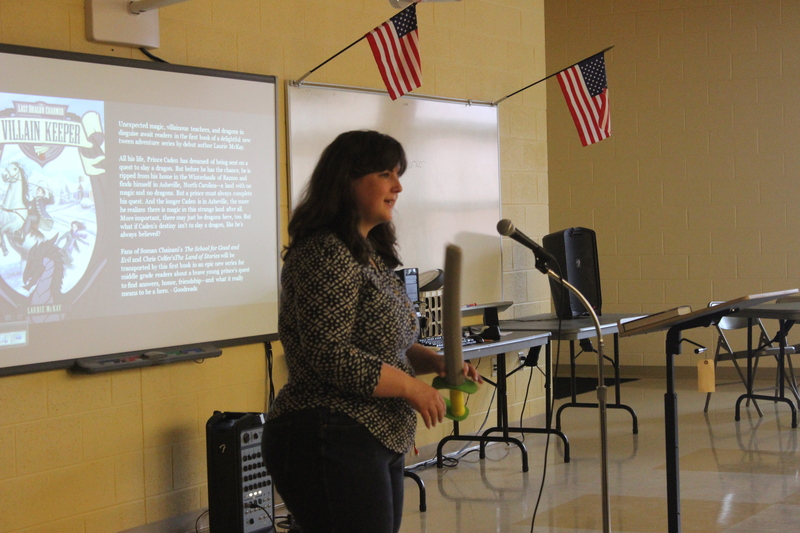 My First Author Visit (with pics and special added cat and dog gifs). 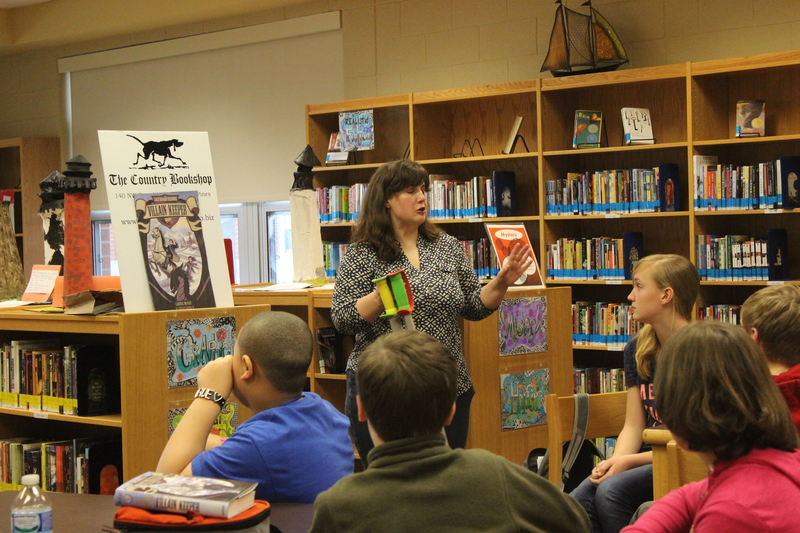 My first school visit was to the Crain’s Creek Middle School through The Country Bookshop. (The Country Bookshop is a wonderful sixty-plus-year-old independent bookstore. I wrote a little about them here at author Shannon Roat’s blog for her ‘Bookstore love’ series.) Of course, I was nervous. I’d never presented to students about my book before. But it’s not that I’ve never spoken in front of students. I taught high school and college biology for ten years. I usually do pretty good in front of a crowd. Usually. One thing I’ve learned teaching, however, is I can never predict how well a presentation, workshop, or lesson will go. Even when everything should go right, I can have a bad day, the class can be grumpy, the great techno gods can smite the computer game I worked for hours to make. All I can do is prepare, take a deep breath, and not take myself too seriously. 1. Have a good detailed plan but not a script. It’s easier to tweak a plan halfway through than change a script if things go wonky. And wonky happens. 2. Entertain myself. That way, at least one person in the room is having a good time. Me. Besides, if I’m bored, I can’t expect everyone else to be interested. 3. And of course, I make sure they the students learn something. Hmm. Maybe this should be number one? 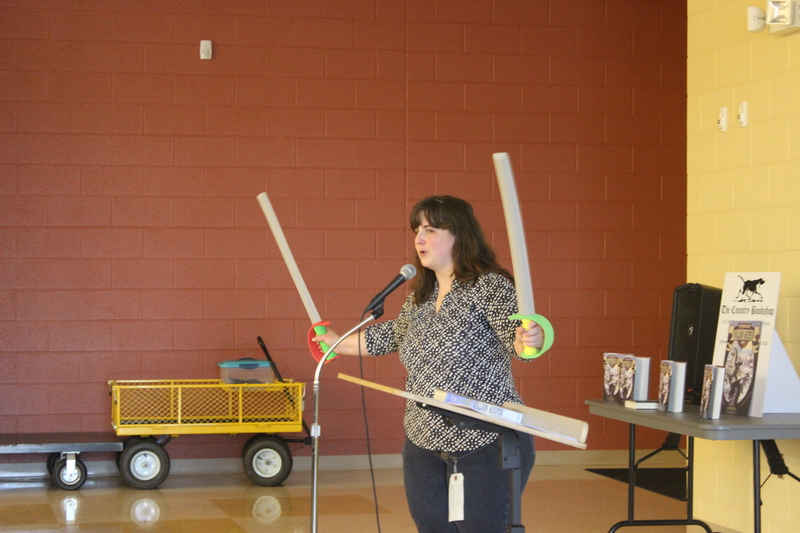 I tried to apply those same teaching skills to my author visit. I guess once a teacher, always a teacher. Although, I also talked about my book. It’s an author visit so that seemed necessary. And I made a game with a horse and dragon, and a ‘can you spot the differences’ cover activity thing. I thought there was like a 60% chance it would work well. The question, of course, is how did it go? It went great! I was lucky enough to have a good day and a wonderful crowd of students. Seriously, I was so impressed with the students at Crain’s Creek. I spoke to sixth graders first, then seventh and eighth graders next. Afterwards, I met with the Battle of the Books group. 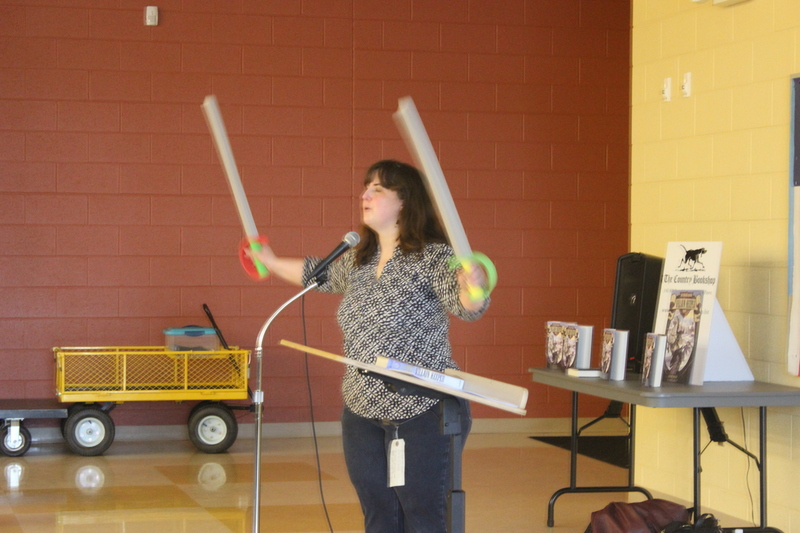 It never hurts to wave your foam swords, either. I just hope all my school visits are as great as the first. I’m going to go visit Crain’s Creek Elementary and then do a quick ‘Meet and Greet’ at The Country Bookshop in Southern PInes, NC. The bookshop even put up a window display 🙂 It’s great to visit the area where I grew up. Check out the window and the article in the local paper – The Pilot.